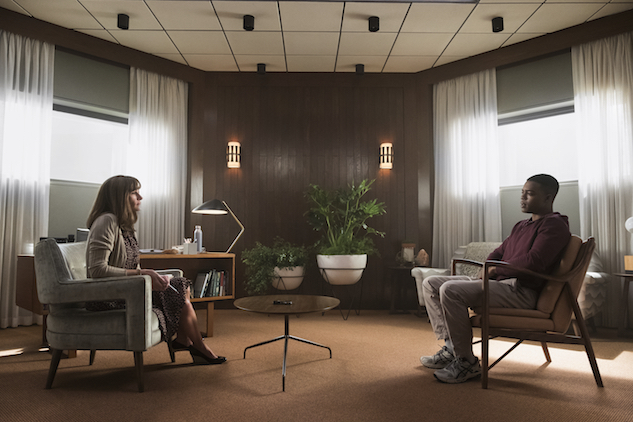 Amazon has shared the first images of Julia Roberts’ foray onto the small screen for their forthcoming psychological thriller. The series, created by Eli Horowitz and Micah Bloomberg, and based on their fictional podcast of the same name, follows caseworker Heidi Bergman (Roberts) in her role of transitioning soldiers back to civilian life, namely one soldier named Walter Cruz (Stephan James). The 10-episode season, all directed by Mr. Robot creator Sam Esmail, will flash back and forth to Heidi’s time at the homecoming facility and her small-town life four years later. Homecoming—also starring Bobby Cannavale, Sissy Spacek, Dermot Mulroney, Shea Whigham, Jeremy Allen White and Alex Karpovsky— will premiere on Amazon Prime this fall. Check out the first-look images featuring Roberts and James as Heidi Bergman and Walter Cruz, respectively.